There’s another location in Idaho for the public to access virtual reality and this time it’s at the Salmon Library! They've got an HTC Vive set up for patrons to use which is running on a Dell Alienware Intel CORE i5 8th Gen laptop. We recently caught up with them about their journey to bring this technology into the library and how they plan on using it. Check out what they had to say! 1) Tell us a bit about how and why the library decided to bring VR to your location? 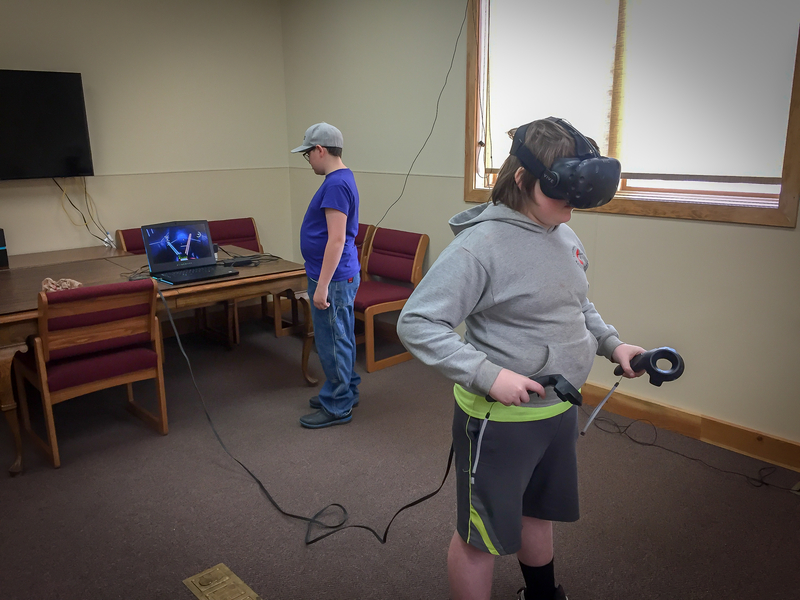 VR came to Salmon Public Library more as taking advantage of an opportunity rather than a conscious decision. We're always looking to expand our services and bring new technology into the fold and this VR rig found its way to us at the right time. A previous colleague of a staff member at Salmon Public Library had a HTC VIVE VR set that wasn't in use and offered to donate it to us, which in the case of a rural library, we said yes please! The only previous experience with VR was utilizing the power of the virtual world to showcase to the library board of trustees what we envisioned for a new space. As a staff member and interested in the Maker movement we had a proposed idea for how our public meeting room could be transformed but we needed to immerse our board in that same vision. Creating a model within google sketchup and exporting it to Model.io so board members could use a phone + Merge VR headset in order to experience this was our first dip into the VR realm. From here it was an eye opening experience to see what else could we do. 2) How and where is it currently being used? Right now there are only a few community members (mainly youth) that know about our virtual reality setup. This was and has been intentional until we figure out a way to roll it out on a more consistent basis. We've put camera mounts up in our small conference room which takes about 15 minutes to convert into our virtual reality space. However this room needs to be booked via our online scheduling software in order to "hold" the room for VR. We're still working on Policy around what is suitable for VR for our younger patrons and how long they can be on it. Right now it's on an “as asked” basis to set it up and monitor the use of the VR computer / headset, which seems to be occurring about twice a month with a handful of youth. We are still in need of training other staff members on vr and the benefits to it so more questions could be answered from our patrons as they find out more about our services we offer. 3) What is the library hoping to achieve with the installation of VR and how do you hope it will impact the community? The vision is always grand when introducing new technology but the progress is often slow. As a library it's always the aim to see how technology can serve the public in a way that enhances their lives beyond entertainment. One such vision for our youth is having them be the stewards of this technology in a way to bring community closer together. It's our hope to partner with the Lemhi County Historical Museum and have our youth go out and use a 3D camera to capture historical sites around our county. Glimore townsite being one, old mine sites, maybe a trip down river, then create a virtual experience with narration for the part of our community that is unable to get out to those areas due to the degree of difficulty in physical accessing those sites. To have a senior be able to come into the museum, put on the headset and experience a virtual tour of our county would be extraordinary as well as offer an entirely new generation buy-in to our museum. It would be fantastic to see Virtual Reality get loaned out as a kit to our Public School as a way to enhance learning for students on certain subject matters. 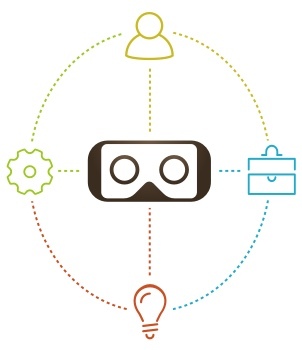 Our plan in April is visit the middle school for the first time with VR and round out their unit on Ecosystems by immersing the students in different environments to feel what that ecosystem might be like without ever stepping foot outside the classroom. We're also going to be introducing VR coming up in April to our adults. Over the winter/spring months of 2019 our STEM Division of programming at the library, called SWITCH, has been running a series of Adult Tech Classes to educate adults on the new services at their local library. These services have ranged from Music Recording, Laser Engraving, CNC Milling, 3D Printing, Videography, Drones, & Virtual Reality! Being the guardian of introducing new technology to a community is a responsibility we don't take lightly and try to do so in a way that is educational, informative, & inclusive. 4) You previously stated that you hoped VR would take youth from playing games to building them. Can you expand on that? Youth that enter the library on a daily basis find relief in online games that provide a reward based model of medicine that make it hard to break. However following the Maker Model a lot of great inventors start off as consumers of that product. Writers were often voracious readers. LEGO Builders, engineers, etc. So why not video game players into developer?. If given the opportunity to create your world, will these youth take that chance? We'll have to find out. 5) What kind of programs will be available for this transformation to happen? One program we have not yet used but are looking to roll out this summer in a VR bootcamp class for youth is Blocksmith XR Salmon Public Library had a booth next to theirs at IETA 2018 and fell in love with their product. It's a VR program to help you build VR in a graphical intuitive way that is scalable for the very beginner. It has a 12 hour curriculum with a framework much like Tinkercard for 3D printing. Many of our youth are familiar with 3D Printing and Tinkercard software so we're hoping to make an easy transition for them to playing to creating. We look forward to seeing where the Salmon Library takes their VR programing! For more information on the Salmon Library and programming, check out their website!